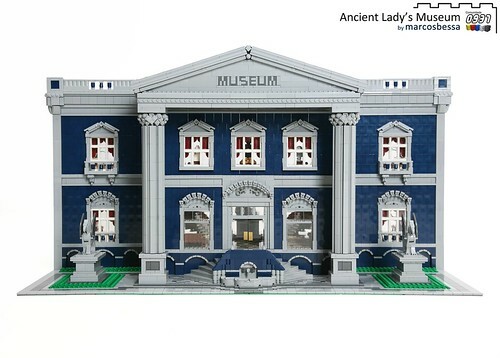 Although this has already been posted on both FBTB and Brother’s Brick I would be remiss in not posting this jaw-dropping creation by Matt De Lanoy. At first glance it doesn’t quite hit you how big and detailed this model really is, that is until you notice that the room is scaled to the Toy Story minifigs. This took me roughly five weeks to create, start to finish. The full layout is 30″x30″, and roughly 36″ high. The ‘scale’ I did this in would put the room at roughly 16 feet square. 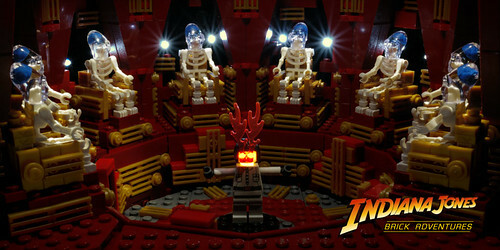 A few changes have been made to the actual room in the movie. Since this is meant to be seen at shows, one wall needed to be taken out. The missing wall contains the main door to Andy’s room – the door on the side is just a closet. Because of this, the dresser and shelves had to be relocated. Fortunately there was plenty of open space – those corners were mostly empty in the movie. For those of you in the Chicago area who would like to see this in person, this will be going on display for the first time at the Northern Illinois Lego Train Club’s Christmas Show in Wheaton, Illinois, Dec. 11th and 12th. 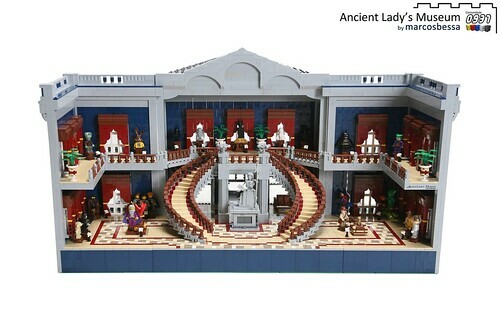 I will also be bringing this to Brickworld 2011 as well as numerous smaller local shows all year round. 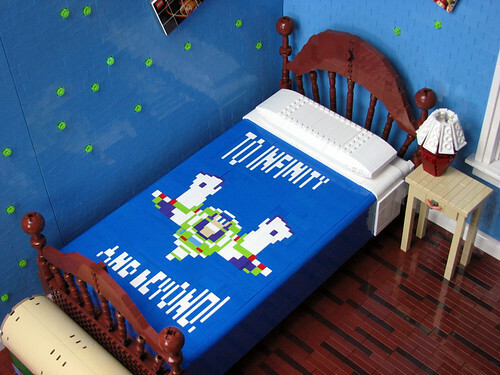 The mosaic on the bedspread is stunning! You can see the full set of images on Matt’s Flickr photostream. Marcos Bessa has created a truly remarkable model. There is so much detail that it can’t even really be appreciated unless you look at the hi-res images. Even a simple bench is cleverly constructed. I will be posting about my big commission soon, but I felt that as I am actually at a LEGO convention, I should talk about that in this post. So, where to begin? After a long, but fun late night drive up with my friend and fellow SandLUG (San Diego LEGO Users Group) member Tiffeny Nervig we arrived at the Freemont Marriott where Bricks by the Bay is being held. First we set up our models. 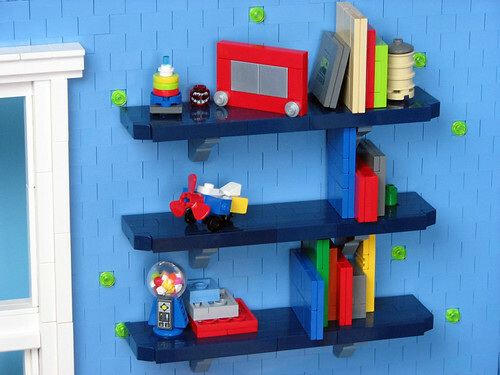 Mine were relatively simple, even if my LEGO Batman Video Game mosaic did end up breaking into multiple pieces. Tiffeny’s very impressive Booty Bay had a little more work. There were several panel discussions and round table presentations going on, but I ended up checking out all the cool MOCs (My Own Creations) that people had made and meeting new friends and some internet friends for the first time. Finally seeing Rex and Hamm in person, and actually getting to hold them was really cool. 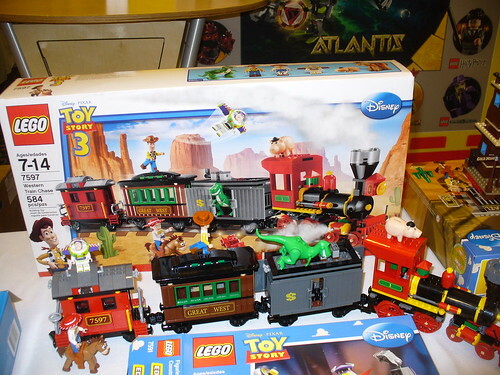 I’m really looking forward to these sets when they come out. 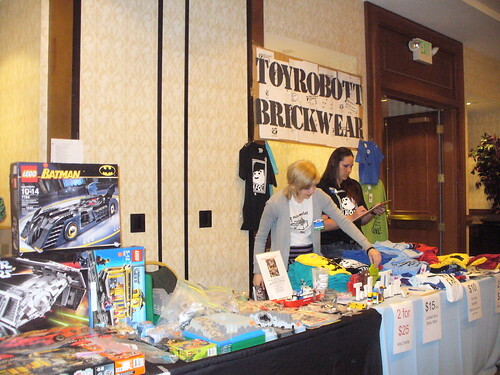 One of the cool new vendors and friends I met at this convention was Ann Bartling of ToyRobott. 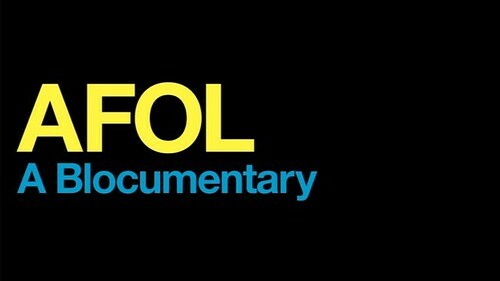 Although I can’t seem to get the video to link directly onto my blog you can watch the video if you click the picture. Although there have been other DS cases and stickers for both LEGO Star Wars and LEGO Indiana Jones this is the first time that the case actually had LEGO elements on it. And what’s even sweeter is the awesome tile mosaic of the classic Star Wars scene. 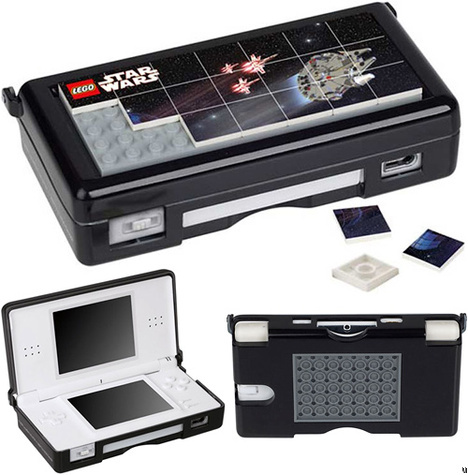 # Protective carrying case for Nintendo DS Lite has two buildable LEGO surfaces for extra fun! Available at StarWarsShop.com It retails for $14.99 UDS, ships worldwide (except Mexico, sorry for those of you South of the Boarder 😕 ) and is currently available for pre-order (product ships in November, just in time for Christmas). Hopefully (fingers crossed) they are printed tiles and not some lame stickers that you have to put on. I’m not a fan of stickers versus actual printed LEGO elements. Without actually being there, it will be hard to really report much about the events and what not, so I’ll have to rely on others’ pictures and my friends from The Brothers Brick too keep all of us non-attendees up to date. I’ll try my best to troll Flickr to find the best representations of BrickCon 09. 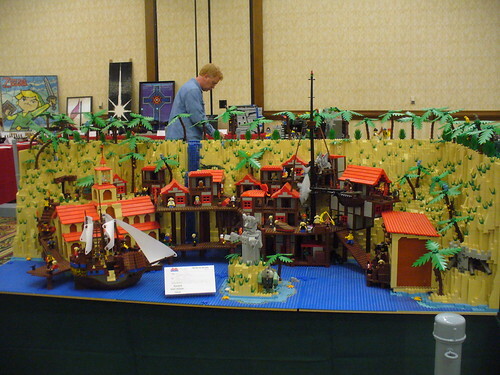 The next LEGO Convention that I know of in the States is Bricks by the Bay which will be held on April 9-11, 2010 in San Francisco. Hopefully I’ll be able to attend, but that’s still months away, so we’ll see. 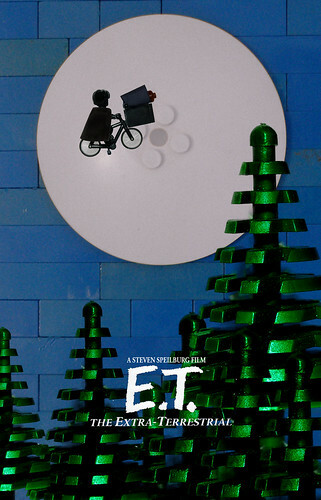 LegoLyons has recreated several iconic movie posters over the past few months. You might have seen some of his work on Flickr, but I just stumbled onto it. He’s got all kinds of them from Jaws, to Batman, to Invaders from Mars. 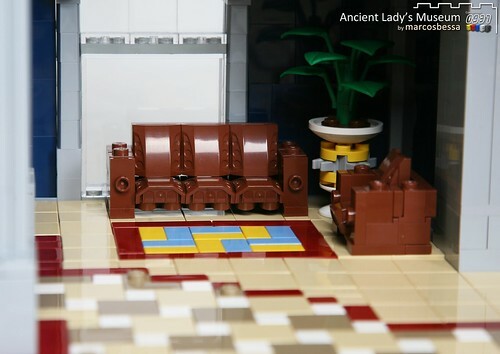 I saw a few photos of Brian Williams’ incredible Brick Adventures from BrickWorld (which sadly I was unable to go to 😦 ). Looking at these models I can just hear the iconic music playing in the background. 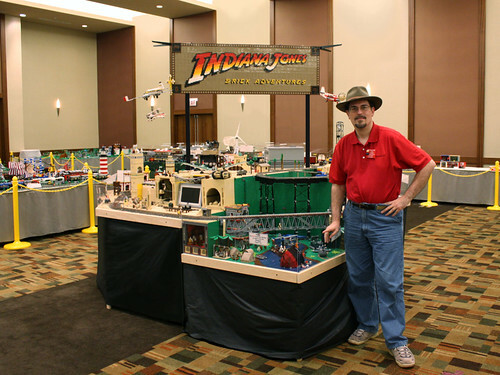 Brian’s attention to detail and all the wonderful lighting effects earned him the World of Lights award at BrickCon. I had no idea the shear size of his entire layout until I saw this picture. He even has a mosaic sign. The San Diego Comic Con is now less than a week away. 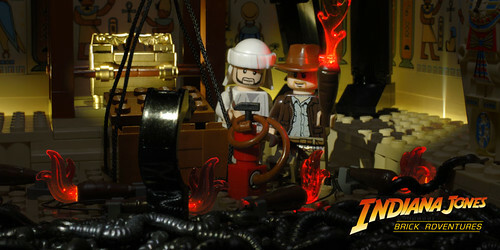 Rumors are swirling at what the exclusive LEGO set (or sets) will be. I’ve heard from different sources that there are possibly three different sets going to be available this year. 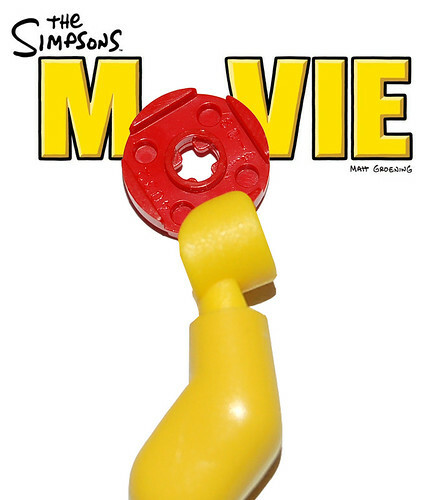 Comic Con exclusives have been a long standing tradition. 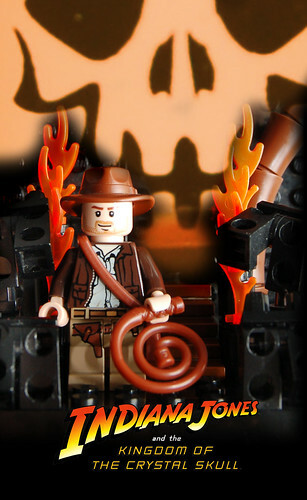 There have only been three official LEGO Comic Con exclusives: the Indiana Jones and Star Wars Clone Wars ones last year, and the Batman and Joker exclusive three years ago. The Batman and Joker exclusive is probably the hardest one to get since it was LEGO’s first Comic Con exclusive ever and they only made 250 to start with. What makes it even more rare is the fact that it isn’t a set. It is more of a stylized diorama with a sound chip where you hear the Joker laughing. Even if you are lucky enough to attend, it doesn’t guarantee you a set. Because they only make 500, LEGO has a lottery system in place. You put your hand in a box and if you are one of the people that gets the right ticket, you can buy the set. 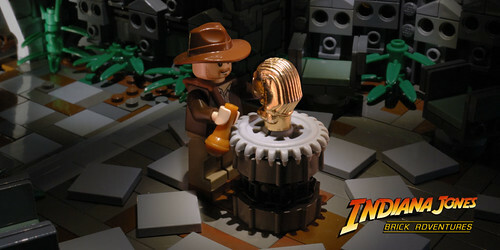 Both the Batman set and the Indiana Jones set were done like that. The Star Wars set was available for purchase by anyone last year. 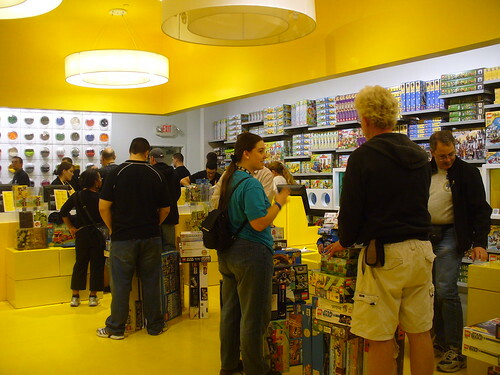 Even so, they still ended up with a few extras at the end that they took back to LEGOLAND because of the high price point and the fact that they had basically repackaged two older Clone War sets with just a few additional items. 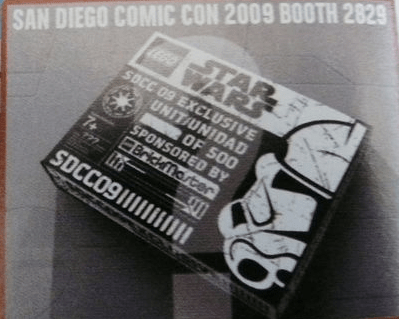 LEGO is not the only company with the lottery system in place, many companies do this at Comic Con to more fairly distribute the ultra-rare sets and figurines that are available only that year. You could actually say there have been four LEGO Comic Con exclusives, since there was a “scavenger hunt” at LEGO, DC, and Warner Brothers to get LEGO Batman and Joker minifigs in an exclusive box for the promotion of the LEGO Batman Video Game last year too. 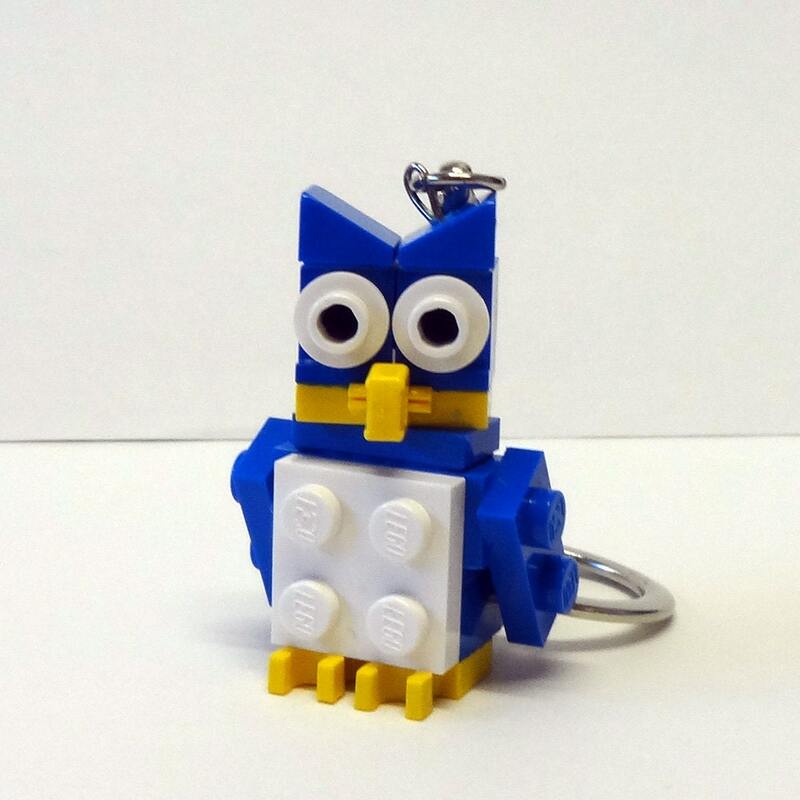 I’ll be helping out at the LEGO booth once again, so if you do get to go, stop by. 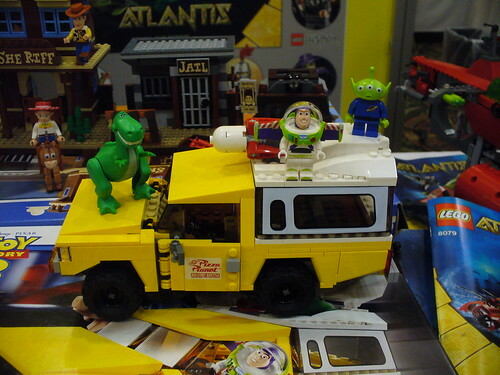 As I mentioned earlier, I know that there will be a life-sized LEGO Buzz Lightyear model on display. There will also be a presentation done by both the BrickJournal at 10:30 am on Friday in Room 3 and DK Publishing for the LEGO Star Wars Visual Dictionary Thursday at 1:30 pm in Room 8.